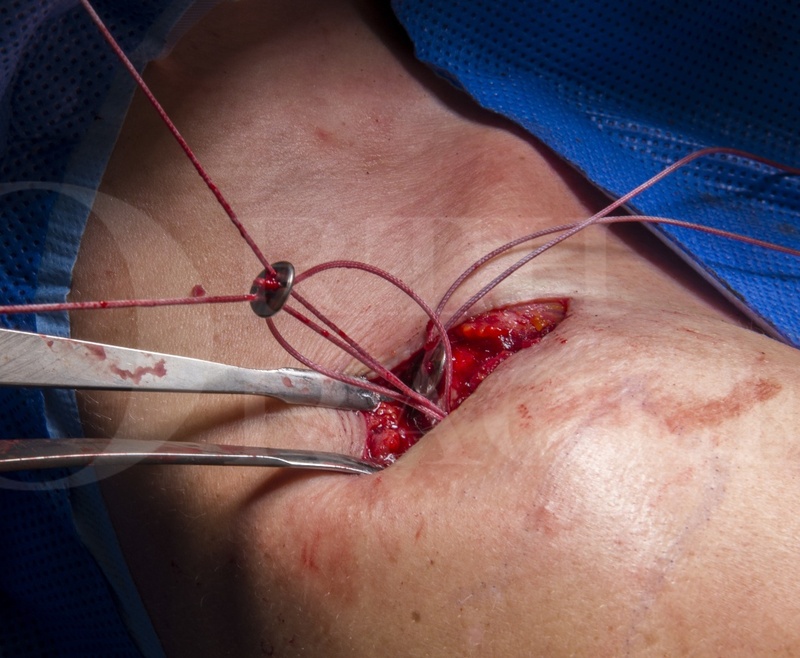 Learn the Open reconstruction of acromioclavicular joint using Arthrex Tightropes. surgical technique with step by step instructions on OrthOracle. Our e-learning platform contains high resolution images and a certified CME of the Open reconstruction of acromioclavicular joint using Arthrex Tightropes. surgical procedure. Injuries to the acromioclavicular (AC) joint are common, making up approximately 4 to 9% of injuries to the shoulder girdle. AC injuries frequently occur during sporting activities, particularly contact pursuits or those with a significant risk of falling, such as cycling. Injuries to the ACJ are 5 times more common in men with a peak incidence in the 20’s to 30’s. The injury typically occurs as a consequence of an inferior force on the lateral portion of the shoulder but may occur as a consequence of force exerted on the humerus. In general surgical intervention will confer an improvement in cosmesis and may improve function particularly during overhead activities. Acute stabilisation is generally considered to be within 2-3 weeks of injury. Beyond this time frame the capacity for the ligaments to heal or scar at an appropriate length following a reduction and stabilisation procedure is likely to be compromised. Numerous alternative procedures have been developed for the management of these injuries in the younger and more active patient. The AC Tightrope (Arthrex) reconstruction was developed originally as an arthroscopic technique by Mr Duncan Tennent (St George’s Hospital, London). This is detailed on OrthOracle at https://www.orthoracle.com/library/arthroscopic-repair-acute-acromioclavicular-joint-separation-arthrex-tightrope-system/. The technique uses a modification of the ankle Tightrope device to reduce and stabilise the coraco-clavicular relationship whilst the coraco-clavicular ligaments heal. The implant acts as a temporary stabiliser and is not designed to provide long-term stability of the ACJ. Subsequent research has supported the benefit of using a double Tightrope technique in terms of strength and stability. The arthroscopic technique though requires a familiarity with arthroscopic shoulder surgery, as well as the availability of the associated arthroscopic equipment, and this may limit its use in a general trauma setting. The open technique I describe in this technique offers a number of advantages over the arthroscopic technique upon which it is based. Importantly it is an anatomically straightforward open approach which does not require a sub-coracoid dissection. This may minimise the risks to the adjacent neurovascular structures which are at risk with sub-coracoid and coracoid loop techniques. Additionally direct visualisation of the coracoid minimises some of the technical complications of this type of procedure including tunnel misplacement and coracoid fracture. Unlike some other devices, such as a hook plate, routine implant removal is not required using an Arthrex Tightrope. It is also worth noting that cosmetically there is little difference between the scars associated with the open and arthroscopic techniques. Non specific complications of CC ligament reconstruction include; scar, infection (approximately 1-4%), irritation from implant prominence requiring implant removal, ACJ discomfort requiring subsequent ACJ excision, post operative gleno-humeral joint stiffness (frozen shoulder approximately 5-8%), fracture (coracoid or clavicle), failure and loss of reduction, calcification of the CC ligaments, anaesthetic risks and neuro-vascular damage. Author: Mr Iain Packham FRCS (Tr & Orth), Consultant Trauma and Orthopaedic Surgeon with a specialist interest in the Shoulder and Upper Limb. Institution: Sport and orthopaedic Clinic, Bristol and North Bristol NHS Trust.